Born in 1870 in the village of Ulala (now Gorno-Altaisk), Grigory Gurkin was an Altai artist, a student of Ivan Shishkin. By origin he was Altaian, a descendant of Telenget khan Konnay. Aged 8, Gurkin attended the icon-painting class of the Altai spiritual mission school. After graduating from the missionary school, he worked as a teacher for a while, but soon turned to icon painting. 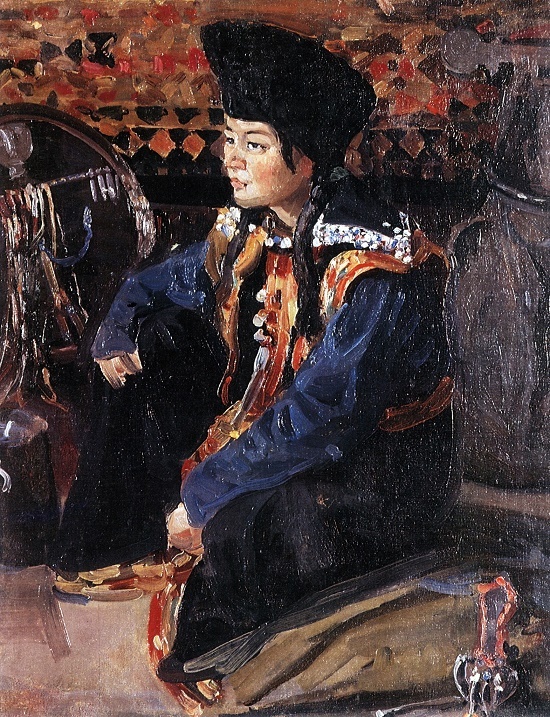 In 1896 Gurkin got acquainted with the collector of Altai folklore, AV Anokhin, who discovered the world of contemporary painting to a young artist. The first picture, with which he tried to get to the Academy (“Night of the victim”), full of mystery and naivety. Orthodox by birth and education, the artist very vaguely depicted the life and religion of the Altaians. Only later, during the creative dawn, the author became seriously engaged in the study of the Altai way of life. Noteworthy, he left thousands of drawings, which also have an ethnographic value. Born 3 November 1951 in Leningrad (now St. Petersburg), Anatoly Fedorovich Alekseyev is a member of the USSR Union of Artists (since 1978). According to his biography, he received his first art education in the secondary Art school where he studied from 1963 to 1970. Next, Anatoly Alekseyev entered the art faculty of the Institute of painting, sculpture and architecture named after I. E. Repin, from which he graduated in 1976. He began participating in the exhibitions of Soviet Art in 1977, and two years later received an award of the USSR Academy of Arts for the best work of art. Also, the artist actively participated in art exhibitions abroad. In particular, in Italy, USA, Germany, France, Finland, Poland, Czechoslovakia, Bulgaria and Luxembourg. 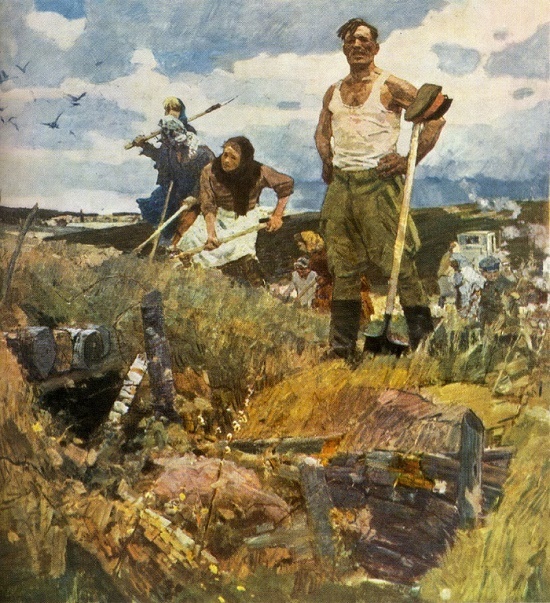 The works of Soviet Russian artist Anatoly Fedorovich Alekseyev are in the Ministry of culture of Russia and museums and private collections in Russia, Italy, USA, Germany and Japan. He currently lives and works in St. Petersburg. 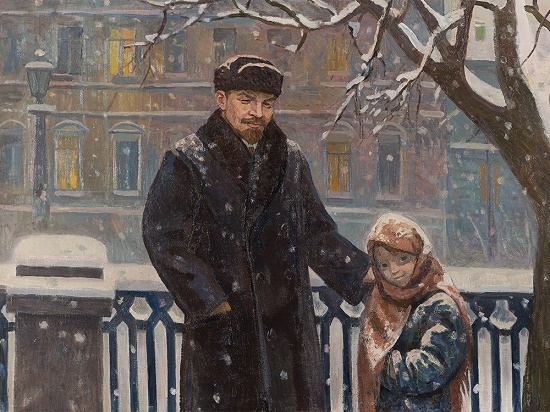 Great Russian artist, a member of the Association of Artists of Revolutionary Russia, People’s Artist of the RSFSR and a laureate of the Stalin Prize of the first degree. 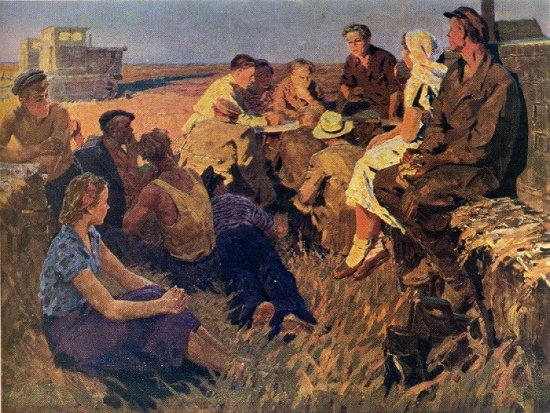 Considered one of the best Soviet battle-painters, master of historical scenes. Distinguished by a special dynamism of the scenes, attention to detail and the heat of events. He created one of the most famous battle works, which is called “The Duel of Chelubey with Peresvet”. 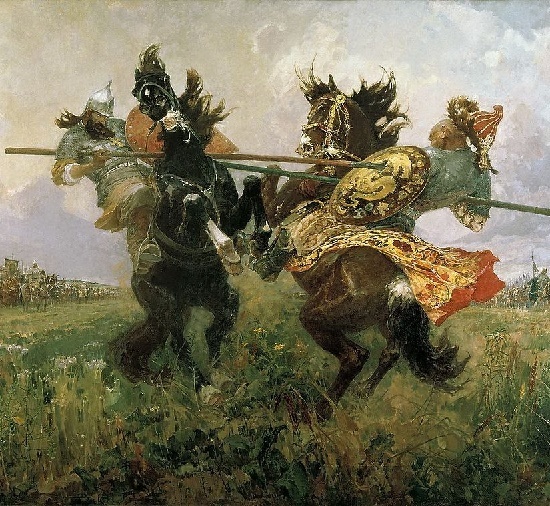 This picture depicts the legendary battle between the two heroes, which shows the invincible spirit of the Russian people, who overthrew the Tatar-Mongol yoke. Noteworthy, created during the Great Patriotic War, it aimed to exalt the self-consciousness of the Soviet people, who fought against the fascist invaders. This picture to date remains a classic battle-historical genre. Mikhail Ivanovich Avilov began his education at the Society for the Encouragement of Arts, then studied at the studio of L.E. Dmitriev-Kavkazsky, after graduating from the Imperial Academy of Arts. From 1922 to 1930 he was a lecturer at the Leningrad Art and Industrial Technical School. Since 1947 he taught at the Institute of Painting, Sculpture and Architecture of I.E. Repin in Leningrad. Currently, his paintings are in the most famous museums in Russia, including the Russian Museum, the Tretyakov Gallery and many others. Born in 1920, Velikiy Rostov of Yaaroslavl region, Rostislav Nikolayevich Galitsky is a prominent Soviet painter. He made first steps under the guidance of his mother and working in Rostov artists and teachers A.I. Zvonilkin (1883-1937) and A.A. Uspensky (1887-1938), who often visited their house. According to his own memories, a great role in his creative development at an early stage played two people. In particular, living in exile Moscow artist S.A. Baulin (1904-1976), as well as an outstanding art historian and art critic, AM. Efros (1888-1954). Works of Rostislav Nikolayevich Galitsky are in the State Tretyakov Gallery, in many museums in Russia, and in Russian and foreign private collections. 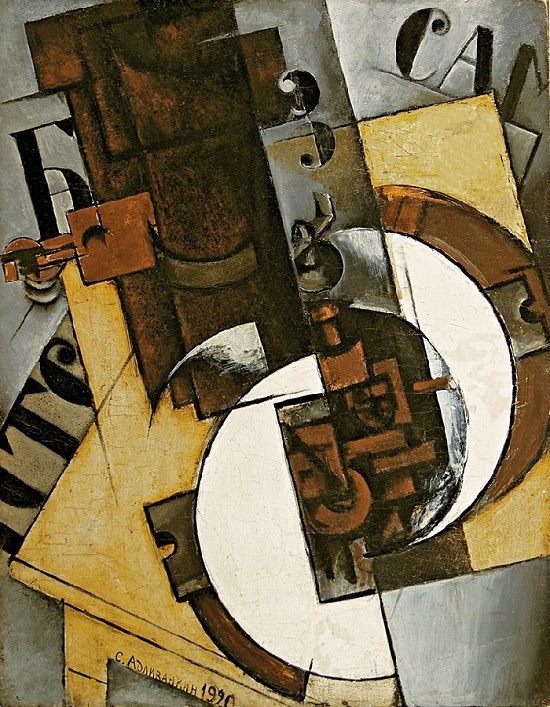 Painter, monumentalist, graphic artist, was part of the “left” wing of Soviet art of 1920-30. He worked with a poster, painted portraits, genre paintings and landscapes. Stylistics of works is close to lubok, primitive, the spirit of AM Rodchenko, and LS Popova. Besides, he did easel works in the grotesque style. However, most valuable are the works created mainly until 1925. Samuel Adlivankin is a typical representative of a generation who entered art together with the revolutionary upheavals of 1917. The pupils of VKHUTEMAS, these artists tried to get involved in the elements of the picturesque searches of the previous time. And, at the same time, greedily took on the signs of the new Soviet reality. In the early 1920s, Adlivankin created a series of works, mostly portraits, admiring the typical character of his models and at the same time showing them ironically. Born on September 18, 1919 in the village of Russian Gorenki of Simbirsk province, Alexander Dmitrievich Romanich was Honored Artist and People’s Artist of the RSFSR. Romanychev studied in the Rostov-on-Don Art College named after M. Grekov (1937-1938). Veteran of the Great Patriotic War, after graduating from the Naval Aviation School he served as a naval pilot. After demobilization he returned to study at the Rostov School, from which he graduated in 1948. And the same year he entered the painting faculty of the Leningrad Institute of Painting, Sculpture and Architecture named after IE Repin. Noteworthy, he studied in the workshop of famous Soviet artists Mikhail Avilov and Yuri Neprintsev. After graduation, he continued studying in the graduate school of the Institute (1954-1957), and then taught art there. Born in the village of Varvarovka of Kharkov region, Evgeniy Volobuev – Soviet painter, Honored Artist of the Ukrainian SSR, People’s Artist of Ukraine. According to Evgeniy Volobuev, all his life he painted only what he worried about, and mostly worked in the genre of easel painting. “And this is a great luxury.” “Perhaps, in the sense of the good things I lost, I definitely lost, but in the main, I think, I won … Yes, otherwise I could not work”, said Yevgeny Vsevolodovich. Volobuev grew in the family of rural teachers. He spent his childhood and youth in Kursk province of Russia, where he began his artistic education under the guidance of the artist NN Arshinov. Later, he graduated from the Kharkov Art College (1928-1931), where he studied in the workshops of AA Kokel and I.Z. Vladimirov. In addition, he received art education in the Kharkov Art Institute (1931-1934), workshops of MA Sharonov and SM Prokhorov. Also, until 1940 he studied at the Kiev Art Institute, the workshop of F.G. Krichevsky and D.N. Shavykin. 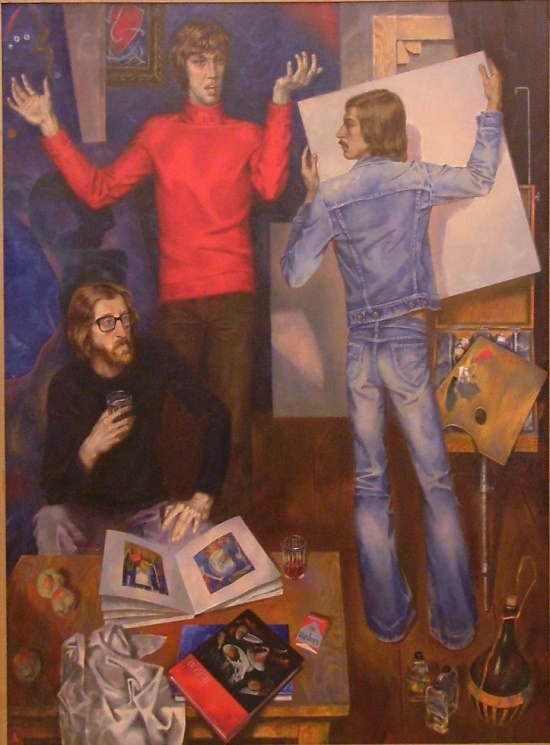 And after graduation, he taught art in the Kharkov Art College, and then at the Kharkov Art Institute.